Aiwan Commate Computer Inc.(Commell), a leading provider of Mini-ITX platform solutions, today announced the introduction of the new embedded LV-667 advanced digital media Mini-ITX mainboard, designed to meet the needs of applications on the rapidly emerging new generation of smart digital entertainment devices such as PVRs, set top boxes, gaming machine, Kiosk and media centers, even NAS, POS and ATM application is suitable. Commell's LV-667 is based on VIA C3 (VIA Eden CPU optional), supports for up to 1GB of DDR400/333/266 SDRAM with the acclaimed FastStream64 memory controller, and a high speed Ultra V-Link interface for a 1GB/s connection to VIA`s feature-leading South Bridge options. Integrating the S3 Graphics UniChrome Pro IGP graphics core, the LV-667 leverages the advanced hardware MPEG-2 and MPEG-4 acceleration features on all display types from CRT and LCD screens to standard definition TVs and HDTVs. Through the onboard VT8237 South Bridge, the LV-667 offers a comprehensive range of integrated storage, multimedia and connectivity options, including Serial ATA, UltraDMA IDE, USB2.0, 2 x 10/100Mbps LAN, IEEE 1394 and V-RAID with support for multiple RAID configurations, The board also support for 6-channel AC97 audio and DVI or HDTV Interface, also offers LVDS Interface from Mini-AGP slot. Onboard embedded VIA C3 1.00GHz CPU. DRAM: 1 x 184-pin DDR266/333/400 SDRAM up to 1 GB . PCI Enhanced IDE: Two UltraATA/100 IDE channels up to 4 ATAPI. LVDS Interface: Optional 18/24-bit LVDS interface Mini-AGP add-on card for LV-667. COMMELL is a trademark of Taiwan Commate Computer Inc.
AValonRF presents its wireless, long range, Digital Links for Unmanned Air Vehicles (UAV), Unmanned Ground Vehicles (UGV), Unmanned Surface Vehicles (USV) and Robotics at AFCEA WEST 2005. The digital links are based on a unique modular concept where each link is composed from a combination of micro modules, connected together via a 100Mbaud full duplex daisy chained serial bus. Approximate size and weight of each module: 60mm x 33mm x 9mm , 14 grams. Size: 60mm x 33 mm x 20mm. V38R Rugged PDA with TR430-2G, running Windows CE. Includes a daylight readable 3.5Â display, biometrics, bar code reader, camera/flash with a 2GB SD card storage, microphone and speaker, USB, RS232, IRDT, 802.11g, Bluetooth & TR430-2G/GPS. Replaceable battery lasts for 8 hours. Hands free, light weight (under 1Lbs) ground station operating with Rockwell/Collins KEO HMD display. Allows operations of a UAV while in motion. TA-8D, TA12D, or TA-16D tracking antenna system. A combination of 8, 12 or 16 RF transceiver modules (see below), RF power amplifiers and diversity electronics. Allows very long range communications with a UAV,UGV or USV from an airplane, vehicle or boat in fast motion and undetectable, unhackable and unjamable data/video/audio links among moving planes/vehicle/boats. AValonRF is a privately held company headquartered in El Cajon (San Diego). More information about AValonRF is available online at http://www.avalonrf.com. AValonRF presents its Miniature Digital wireless long range links for based on a unique modular concept where each link is composed from a combination of micro modules, connected together via a 100Mbaud full duplex daisy chained serial bus. Typical applications are UAV, UGV, USV, Robotics, Industrial control, Video Signage, Telemetry, Broadcast and Security. AValonRF presents and demonstrates its wireless, long range, Digital Links for Unmanned Air Vehicles (UAV), Unmanned Ground Vehicles (UGV), Unmanned Surface Vehicles (USV) and Robotics at the AUVSI chapter meeting in San Diego on February 24, 2005. Approximate size and weight of each module: 60mm x 33mm x 9mm, 14 grams. HMPC-1.6 Wireless helmet mounted wearable computer, running Windows XP Embedded (or Linux) (includes Module F, Module D and TR430-3G x 2 (for diversity). Optional Module C for TCP/IP + USB + on board DVR) Hands free, light weight (under 1Lbs) ground station operating with Rockwell/Collins KEO HMD display. Allows operations of a UAV while in motion. Allows very long-range communications with a UAV, UGV or USV from an airplane, vehicle or boat in fast motion and undetectable, unhackable and unjamable data/video/audio links among moving planes/vehicle/boats. AValonRF designs and produces state-of-the-art wireless links that include receivers, transmitters, Wearable computers, In Car Video Systems, remote display units, DVRs, rugged wireless PDAs, Rugged PCs, No moving parts tracking Antennas, Wireless Microphones, Miniature MPEG 4 Encoders, Miniature MPEG4 Decoders and a variety of specialized antennas. AvalonRF also designs and produces wireless terrestrial "last mile" mobile UHF, narrow band, high data rate, 802.22 based solutions. AvalonRF intelligent true diversity technology provides broadcast quality interference-free video links over the frequency spectrum of 56MHz to 2.5GHz. A wireless link from Avalon RF is an affordable easy to install video solution with superior image quality. In the summer of 2013, the Huddersfield based agency made the decision to re-develop their enterprise eCommerce platform from the ground up, taking a mobile first approach. When complete in winter 2013, the new responsive eCommerce platform will be ready to roll out to their existing and prospective clients. All features of their legacy platform will be maintained, plus many new features will be available. The Voracio ePOS integration for true multi channel retailing is a further advance in their field of expertise. Codenamed ‘Voracio,’ Chameleon see this as future proofing project which will result in “one platform for all devices” and represent a major advance in their stature with the professional and enterprise eCommerce arena. “In the past, there were two types of websites a business could choose to have developed to cater for the mobile audience. One was to ask their web developer to build a stripped down mobile version of the desktop site, using redirects for mobile traffic, the other being to commission a mobile specialist firm to develop a separate mobile site. These approaches served well in the past, however are becoming outdated, both having considerable and increasing drawbacks in regard to costs and user experience. Here are just a few of the major issues,” added James. “Having separately hosted sites often causes issues with content synchronization, including expensive integration development costs. This is because the mobile and desktop site usually pull content from two separate data sources,” James continued. 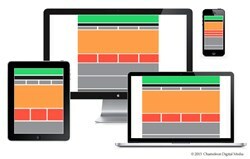 But what of the performance and technical implications for a responsive site? The company concluded several months back that responsive eCommerce is without doubt the way to go, they believe it is the future of online retail and as such have invested much time and focus on the development of their new responsive ecommerce platform, codenamed ‘Voracio.’ They are looking forward to rolling out our first sites later this year. Chameleon Digital Media are a growing force in the eCommerce platform arena. Established in 1998 as a graphic and web design agency, over the past several years Chameleon have invested heavily in the development of their own eCommerce platform. This platform is used by scores of online retailers throughout the UK. Chameleon are midway through the development of their all new responsive ecommerce platform, code named ‘Voracio’ which makes use of the best in responsive web design techniques. It is set to be one of the first fully responsive ecommerce platforms available in the UK, taking a one platform for all devices approach. The Huddersfield based business are a full service digital agency, offering ecommerce, CRM integration, web design, online marketing, SEO, PPC and branding. Their success has been attributed to having the right mix of creativity and technical expertise alongside a friendly and personal service. Salem College, the oldest continuously operating women’s college in the US, has implemented iMirus’s breakthrough Digital Communication Solution. This solution offers Salem’s prospective students, a viewbook on the go, with content accessible via every major mobile platform. iMirus’s innovative enrollment solution offers universities operating under increasing financial pressure, an interactive prospect and student experience that can reduce costs, and increase qualified student enrollment. iMirus helps colleges and universities transform their printed publications into multi-media platforms that drive engagement and revenue growth. With capabilities that include embedded video, live RSS feeds, social media sharing, and comprehensive analytics- the Digital Communication Solution offers affordable, robust functionality, typically only found in more expensive custom applications. Scott Crockett from Keiger states, "We are focused on delivering innovative solutions that keep our clients on the forefront of effective and engaging student communications. iMirus' Digital Communication Solution offers a cost-effective way to transform communication with prospects by encouraging engagement and interaction while offering deep insight." The Digital Communication Solution enhances and expands universities’ abilities to reach, understand, and inform their stakeholders. To learn more, please contact info http://www.imirus.com or call 386-283-5984.
iMirus®, a leading customer communications technology company, puts Your Brand in Hand™ with a platform that enables content distribution and content enhancement on tablets and smartphones. iMirus® turns documents, publications and marketing communications into EXTRAORDINARY user experiences. iMirus® integrates print with rich media, creating compelling, interactive communications accessible via customized apps and viewable on tablets, smartphones and online. Launched in 2008, iMirus® distributes engaging, insightful content for over 150 clients and enables over 200,000 app downloads per month. iMirus® has experience working with a wide range of companies across sectors including Forbes, Delta Airlines, Conde Nast, Zappos, NetSuite and the U.S. Government. iMirus® has offices in Tulsa, OK; Austin, TX; and Palm Coast, FL. Learn more at the iMirus website http://www.imirus.com or contact us at 386-283-5984 to easily expand your capabilities. Fujitsu Microelectronics Europe (FME) has been working closely with UK digital set top box (STB) manufacturer, TVonics Limited, who is commencing mass production of its stylish, digital terrestrial set top box for the UK and European markets. This unique, European designed STB uses key components that have been either designed or manufactured within Europe. The TVonics designed product, which delivers fast, responsive performance at an affordable price, will be on sale from the end of September 2005. This new STB, manufactured in the UK by Sony for TVonics, is initially being rolled-out to serve the high-growth UK digital terrestrial market for Freeview services. Offering a distinctive styling and form factor, it offers end consumers a refreshing alternative to the traditional silver or grey rectangular boxes currently on sale. Designed to minimise ecological impact through the use of lead-free components, a recyclable aluminium enclosure, and low power consumption, it will conform to the Reduction of Hazardous Substances (RoHS) EU mandate for products sold from January 2006 onwards. It is expected to be in high demand by British consumers, eager to enjoy the popular range of digital television programmes available on Freeview. TVonics selected FMEÂs ÂSmartMPEGÂ MB86H25B decoder for use in the new STB, due to its low power consumption & system cost, which was made possible through its optimised silicon integration design techniques. The chip was designed at FMEÂs Multimedia Development Centre in Frankfurt, Germany, and requires just one SDRAM and a Flash memory, consuming less than 700mW in full operation. This 3rd Generation SmartMPEG device has enjoyed excellent success around the world, with over 10 million unit deployments. The design win at TVonics spearheads its expansion into the buoyant European digital terrestrial television market. FMEÂs SmartMPEG family allows many different applications to be executed - in this case an optimised DVB-T Adapter with interactivity - but it is also suited to automotive applications; Personal Video Recorder, Dual/Twin Receiver, Portable and semi-professional applications; as well as satellite receivers, when used in combination with Fujitsu's QPSK Silicon Tuner. The two companies were able to combine their experience in order to reduce the STB product development time to just 6 months. This was partly due to the application software being based on the Cabot Aurora DVB Middleware reference port, carried out last year between FME & Cabot Communications. Production of the circuit board, product assembly, test and packing is being carried out by Sony Manufacturing, Pencoed Technology Park, UK - a natural choice for TVonics which is based on-site within the Technium Digital@Sony, technology incubation centre, established by Sony and the Welsh Development Agency in 2004. Paul Fellows, CEO of TVonics said, ÂThe silicon chip technology and technical support provided by Fujitsu, together with the software technology of Cabot, has enabled TVonics to enter the market quickly with a product delivering superior performance at a very competitive price. This development has been an excellent example of how three European based design groups can work together to deliver class leading products to market quicklyÂ. He continued, ÂThe excellent co-operation from Fujitsu has led to very close links being forged between the two companies resulting in the perfect design mix. The new box will be announced and featured on our Stand 215, Hall 5 at IBC 2005 in Amsterdam from 9th-13th SeptemberÂ. Johannes Richter, Multimedia Business Unit Director at FME, added, ÂThe experience and professionalism from TVonics perfectly matched our own when it came to the design of an elegant, unique product to bring to market in the UK and Europe. We are extremely happy to have been part of this design and look forward to a long relationship with TVonicsÂ. He added, ÂWe were able to achieve this fastest turnaround time from design start to production start in just 6 months including CabotÂs Pan-European Aurora DVB middleware stack with MHEG-5 functionality, because of the skilled engineers at TVonics designing a right-first-time solution, and the availability of Middleware from CabotÂ. Darren Standing, Business Development Manager at Cabot Communications commented, ÂSince being selected by TVonics in February 2005 to support its development programme, we have worked closely with engineers at FME and TVonics to deliver for the first time, an Aurora DVB-T Middleware market deployment running on FME's SmartMPEG technology. TVonics has used the performance and flexibility of Aurora to rapidly integrate its own innovatively styled user interface, system software and device drivers to deliver a market leading DVB-T solution in record timeÂ. There are up to 80 million TVs and VCRs in the UK, and the British government wants all receiving equipment to be able to handle digital signals by 2012, when analogue broadcasting will be switched off. Throughout Europe, an estimated 600 million units will need to be converted or replaced with digitally-enabled equipment in the next 10 years. Figures above are based on typical usage of 2.5 TVs or VCRs in all registered TV households. All product names and proper names mentioned herein are trademarks or registered trademarks of their respective companies. Based in South Wales, UK, TVonics Ltd. designs state-of-the-art digital set top boxes and flat screen digital televisions for the European market. Managed and staffed by a team of industry professionals, with extensive product design experience gained previously at leaders in consumer electronics, broadcasters and semiconductors, TVonics delivers production line ready, digital television solutions. TVonics specialises in the design of innovative digital set top boxes which viewers find very easy to connect and operate. It also designs modular components for integration into digital televisions. The company additionally provides consultancy services to television, monitor and personal computer manufacturers seeking to enter the digital TV market. Services include product concept and design, out-sourced manufacturing, product compliance, testing, marketing and training. Cabot Communications is a leading independent European supplier of digital TV software for set top boxes and integrated TVs. CabotÂs TV middleware stack enables manufacturers to build and support cost-effective and differentiated receivers for pan-European coverage of digital TV and interactive broadcasts. With nearly three million deployments, Cabot delivers a complete modular digital TV software solution for a wide range of CPU architectures. Combined with CabotÂs specialised digital TV services including integration, design consultancy and field support, Cabot enables OEMs to get compelling products to market quickly. CabotÂs technology is robust and deployed with over 20 major manufacturers. Cabot Communications will be exhibiting at this years IBC show in Amsterdam and can be found at stand number 1.130. For more information, visit http://www.cabot.co.uk. StrandVision LLC and Shuttle Computer Group, Inc. today announced a marketing agreement under which StrandVision will sell a new digital signage point-of-display digital media player. The device is based on Shuttle DS61 hardware that comes preloaded with, and is optimized to display, StrandVision's patented digital signage content software. 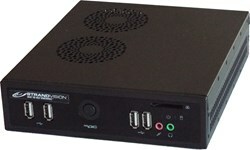 Branded the StrandVision R360 Digital Media Player, the new player is a slim (6.5" x 7.5" x 1.8"), powerful x86-based Linux digital signage platform that offers the best quality, performance and connectivity to process high-quality digital media. When coupled with StrandVision's Internet-based, hassle-free, digital signage software, it presents an unparalleled electronic signage package. "At StrandVision our goal is to make digital signage setup and administration as quick and easy as possible and the R360 Media Player supports that goal," commented Mike Strand, StrandVision founder and CEO. "Customers simply plug the device into their display and connect it to the Internet. It automatically selects one of the StrandVision digital signage host servers from the cloud, logs in using a preloaded username and password, initializes the connection and begins transmitting the user's digital signage content in seconds. Remotely managed digital signage doesn't get any easier." The R360 Digital Media Player works seamlessly with StrandVision's cloud digital signage servers and requires virtually no local administration. The fully configured player includes universal hardware to mount the unit directly onto a display or a wall mount, making installation quick and simple. "Joining Shuttle's innovative hardware with StrandVision's software creates an easy-to-implement and manage package that will meet its customers' needs," said Marty Lash, director, sales and marketing, Shuttle Computer Group, Inc. The R360 Digital Media Player is remotely updated and managed by the StrandVision patented digital signage software minimizing end-user housekeeping. Each customer unit constantly receives digital signage content updates from the StrandVision Web portal yet can run independently if there is an Internet interruption. The StrandVision player is capable of self-correcting most issues and automatically sends system performance updates and alerts to StrandVision and digital signage system administrators. In addition to a more powerful processor and increased storage and memory, the new StrandVision player includes several upgrades and features. Wi-Fi® communication, previously a $ 79.99 option, is now included; a DVI™ video output has been added, along with the previously available HDMI® port for connection to digital displays; a VESA™ mounting kit, which can save up to $ 150.00 for specialized wall mounts. Priced at $ 699.99 (a $ 180.00 reduction from previous StrandVision media players), the fully configured system, including StrandVision's patented digital signage display software, is available immediately directly from StrandVision and through authorized resellers and system integrators. An optional two-year warranty that extends the standard one-year warranty to a total of three years is available for $ 89.99. Shuttle Computer is the North American subsidiary of Shuttle Inc., a publicly traded company established in 1983. Shuttle specializes in small form factor PC hardware for digital signage, point-of-sale (POS) and interactive kiosks in the retail, restaurant, food service and hospitality industries, as well as motherboards and bare bones systems. For more information, visit http://us.shuttle.com or call 1-888-972-1818. StrandVision LLC, based in Menomonie, Wisconsin, delivers low-cost, Web-based digital signage software through a patented Software as a Service (SaaS) approach that delivers content to subscribers' LCD flat panel screens, as well as computer screens and websites. StrandVision's service distributes text and graphics pages, video content and national and local weather and news. It is ideal for many large and small business marketing applications, including medical and dental offices (patient education); banks, retailers and industrial distributors (video merchandising); education (student communication, staff and visitor information); employee break rooms (employee communication of events and benefits); nonprofit and religious organizations (member and supporter communication). Wi-Fi is a registered trademark of the Wi-Fi Alliance. DVI is a trademark or registered trademark of SONIVOX, L.P. HDMI is a trademark of HDMI Licensing. VESA is a trademark of the Video Electronics Standards Association. Other names may be trademarks of their respective owners.